These methods are provided by Domo in the Connector Dev Studio to make it easier for you to build your custom connector. These methods are specifically used in the authentication code block. auth.authenticationSuccess() none none Set during the authentication process to indicate that the credentials have been successfully validated. auth.authenticationFailed(errorMessage) errorMessage none Set during the authentication process to indicate that the credentials could not be validated. Domo provides methods and constants to help you insert your data into Domo. These methods and constants are specifically used in the data processing code block. These constants are used to define the data type of a column in a datagrid. datagrid.DATA_TYPE_STRING Set a column dataType to receive a string. datagrid.DATA_TYPE_DOUBLE Set a column dataType to receive a number. datagrid.DATA_TYPE_DATETIME Set a column dataType to receive a date/time. Dates inserted into the table need to be formatted yyyy-MM-dd’T’HH:mm:ss. datagrid.DATA_TYPE_DATE Set a column dataType to receive a date. Dates inserted into the table need to be formatted yyyy-MM-dd. These methods are used when storing data from your API endpoint in Domo. datagrid.addColumn(columnName, dataType) columnName, dataType none Adds a column to a table. Defines the data type used by the column. datagrid.addCell(cellData) cellData none Adds data to one cell in the table. Columns must be defined first. datagrid.endRow() none none Indicates a row of data is complete and a new row in the table needs to be started. datagrid.error(code, errorMessage) code, errorMessage none Ends the processing of data and returns an error message to the user. datagrid.magicParseCSV(csvString) csvString none Populates the entire datagrid when passed a properly formatted string of comma-separated values. datagrid.magicParseJSON(jsonString) jsonString none Populates the entire datagrid when passed a string representation of properly formatted JSON. datagrid.magicParseXML(xmlString) xmlString none Populates the entire datagrid when passed a string representation of properly formatted XML. If you are using the Discovery option in Advanced Mode in the Configure Reports step, Domo provides methods and constants to help you. These methods and constants are specifically used in the discovery code block. This constant is used when building a discovery tree menu. discovery.tree Used with a discovery tree. This references the root node in a discovery tree. These methods are used when building a discovery tree or discovery dropdown. discovery.addOption(optionValue) optionValue none Used with a discovery dropdown. Adds an option to the dropdown menu. discovery.addNode(parentNode, nodeName) parentNode, nodeName createdNode Used with a discovery tree. Creates a new child node within the node that is passed as a parameter. Returns a reference to the newly created node. discovery.addLeaf(parentNode, leafName) parentNode, leafName none Used with a discovery tree. Creates a new child leaf within the node that is passed as a parameter. discovery.publishTree() none none Used with a discovery tree. This method indicates that you have finished constructing a discovery tree. These methods may be useful in any code block. DOMO.log(value) value none Prints to the Dev Studio console. Make sure you remove any credentials that you are logging for testing before you submit your connector. DOMO.sleep(milliseconds) milliseconds none Can be used to space out HTTP requests. DOMO.getState(key) key value Returns the value of the requested state. DOMO.setState(key, value) key, value none Can be used to set a state value which can be returned using DOMO.getState(key). DOMO.parseXML(xmlString) xmlString jsonObject Used to convert XML to JSON for easier parsing. DOMO.getStartDate(metadata.parameters[“Date”]) Date date Used to set the start date. DOMO.getEndDate(metadata.parameters[“Date”]) Date date Used to set the end date. DOMO.b64EncodeUnicode(stringToEncode) stringToEncode encodedString Encodes a string using base64 encoding. DOMO.hmacSHA1(stringToEncode, key) stringToEncode, key encodedString Encodes a string using the provided key to create a hmac-SHA1 hash. DOMO.hmacSHA256(stringToEncode, key) stringToEncode, key encodedString Encodes a string using the provided key to create a hmac-SHA256 hash. DOMO.md5(stringToEncode) stringToEncode encodedString Encodes a string using the md5 algorithm. DOMO.getJWT() none tokenString Creates a JSON web token (JWT) using the assigned algorithm signed with the provided key. Note: You must set the algorithm, key, issuer, subject, expiration, and other claims. See the provided code example. When making your HTTP requests, use the following methods to add headers and parameters, and to make HTTP calls. Note: All URLs must use https. httprequest.addHeader(key, value) key, value none Add a header to your HTTP request. This is how you can add an Authorization header or any other header you need to your HTTP request. Add headers and parameters before you make the HTTP request. httprequest.addParameter(key, value) key, value none Add a parameter to a base URL. Add headers and parameters before you make the HTTP request. httprequest.clearParameters(url) url none Remove any parameters you have added to an HTTP request object. httprequest.clearHeaders(url) url none Remove any headers you have added to an HTTP request object. httprequest.getHeader(key) key headerValue Get a string containing a particular header’s value from your HTTP request. If you have added headers using the httprequest.addHeader method, you can use this method to retrieve that value. httprequest.getResponseHeader(key) key headerValue Get the string containing a particular header’s value from your HTTP response. If there are multiple response headers with the same name, then their values are returned as a single concatenated string, where each value is separated by a pair of comma and space. httprequest.getStatusCode() none responseCode Get the HTTP response code from your HTTP request. After you make a httprequest.get, httprequest.post, or httprequest.post call, the HTTP response will have a number code. Usually 200 is used if the request has succeeded. For more information, see here. httprequest.get(url) url responseString Make an HTTP GET request. Any headers or parameters added before making the request will be included by Domo when making the get request. All URLs must use https. httprequest.post(url) url responseString Make an HTTP POST request without any request body. Any headers or parameters added before making the request will be included by Domo when making the post request. All URLs must use https. httprequest.post(url, bodyString) url, bodyString responseString Make an HTTP POST request with a request body. Any headers or parameters added before making the request will be included by Domo when making the post request. All URLs must use https. httprequest.put(url, bodyString) url, bodyString responseString Make an HTTP PUT request with a request body. Any headers or parameters added before making the request will be included by Domo when making the put request. All URLs must use https. //Access accessToken in the account object. //Access a parameter named "Region in United States"
//This will return an array of strings if the parameter type is a discovery tree. This will return a string if it's any other parameter type. These SQL methods are used in the data processing code block. They are specifically used in the cases that require the state to be saved between runs. To store the state of the database between runs, the ‘Save Database Between Runs’ checkbox must be checked. Set during the authentication process to indicate that the credentials have been successfully validated. Set during the authentication process to indicate that the credentials could not be validated. errorMessage: Message indicating why the authentication failed. These constants are specifically used in the data processing code block to define the type of your data in each of your datagrid columns. Set a column dataType to receive a string. Set a column dataType to receive a number. Set a column dataType to receive a string. Dates inserted into the table need to be formatted yyyy-MM-dd’T’HH:mm:ss. These methods are specifically used in the data processing code block to insert your data into Domo. Adds a column to a table. Defines the data type used by the column. 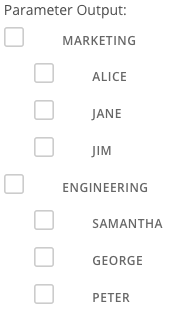 columnName: The column name that the user will see when they look at the table. dataType: The Domo data type. It may be datagrid.DATA_TYPE_STRING, datagrid.DATA_TYPE_DOUBLE, datagrid.DATA_TYPE_DATETIME, or datagrid.DATA_TYPE_DATE. Adds data to one cell in the table. Columns must be defined first. cellData: The datum to be inserted into this table cell. The type of the data should match the type in the column. Indicates a row of data is complete and a new row in the table needs to be started. Ends the processing of data and returns an error message to the user. code: A integer code you would like to use to define the error. errorMessage: An error message that will be returned to the user. Populates the entire datagrid when passed a properly formatted string of comma-separated values. The magicParse automatically determines type, and leaves any undetermined types as strings. csvString: A string containing a comma-separated values. The first line should contain the comma-separated column names. Populates the entire datagrid when passed a string representation of properly formatted JSON. The magicParse automatically determines type, and leaves any undetermined types as strings. jsonString: A string representation of a properly formatted JSON. The magicParseJSON method only works for JSON table data presented in key/value pairs. Populates the entire datagrid when passed a string representation of properly formatted XML. The magicParse automatically determines type, and leaves any undetermined types as strings. xmlString: A string representation of a properly formatted XML. This constant is used when building a discovery tree menu in the Configure Reports Advanced Mode. Used with a discovery tree. This references the root node in a discovery tree. These methods are used when building a discovery tree or discovery dropdown in the Configure Reports Advanced Mode. 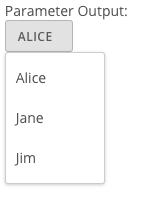 Used with a discovery dropdown. Adds an option to the dropdown menu. optionValue: The value to be displayed in the dropdown menu. Used with a discovery tree. Creates a new child node within the node that is passed as a parameter. To create a node at the root level, you must use discovery.tree as the node parameter. parentNode: An existing node object in the discovery tree. nodeName: The name displayed on the new node. createdNode: A reference to the newly created node object. Used with a discovery tree. Creates a new child leaf within the node that is passed as a parameter. leafName: The name displayed on the new leaf. Used with a discovery tree. This method indicates when you have finished constructing a discovery tree. Prints to the Dev Studio console. Make sure you remove any credentials that you are logging for testing before you submit your connector. Can be used to space out http requests. milliseconds: An integer value representing the number of milliseconds you want your connector to sleep. If you have set a state for your connector, this method returns the value of the requested state. key: The key to the state. value: The value stored with that key. If you need to set a state for your connector, this method can be used to set a state value which can be returned using DOMO.getState(key). Used to convert XML to JSON for easier parsing. xmlString: The key to the state. Used to set the start date. Used to set the end date. These methods may be useful in any code block to encode data. Encodes a string using base64 encoding. Base64 encoding is used in the Basic Authentication process, and most endpoints that use username and password will use the Basic Authentication standard. stringToEncode: The string you wish to encode with base-64 encoding. encodedString: The base-64 encoded string. Encodes a string using the provided key to create a hmac-SHA1 hash. stringToEncode: The string you wish to encode. key: The string used to create the hmac-SHA1 hash. encodedString: The hmac-SHA1 encoded string. Encodes a string using the provided key to create a hmac-SHA256 hash. key: The string used to create the hmac-SHA256 hash. encodedString: The hmac-SHA256 encoded string. Encodes a string with the md5 algorithm. stringToEncode: The string you wish to encode with md5 encoding. encodedString: The md5 encoded string. Creates a JSON web token (JWT) token using the assigned algorithm signed with the provided key. Note: You must set the algorithm, key, issuer, subject, expiration, and other claims. These methods may be useful in any code block. When making your HTTP requests, use the following methods to add headers and parameters, and to make HTTP calls. Add a header to your HTTP request. This is how you can add an Authorization header or any other header you need to your HTTP request. Add headers and parameters before you make the HTTP request. key: A string that is the header key. value: A string that is the header value. Add a parameter to a base URL. Add headers and parameters before you make the HTTP request. key: A string that is the parameter key. value: A string that is the parameter value. Remove any parameters you have added to an httprequest object. url: The URL that you used to make an HTTP request. Remove any headers you have added to an httprequest object. url: The URL you used to make an HTTP request. Get a string containing a particular header's value from your HTTP request. If you have added headers using the httprequest.addHeader method, you can use this method to retrieve that value. headerValue: A string that is the value associated with the provided key. When you make an HTTP request, the response will usually include a header containing a set of key/value pairs. Use this method to get the string containing a particular header’s value from your HTTP response. If there are multiple response headers with the same name, then their values are returned as a single concatenated string, where each value is separated by a pair of comma and space. Get the HTTP response code from your HTTP request. After you make a httprequest.get, httprequest.post, or httprequest.post call, the HTTP response will have a number code. Usually 200 is used if the request has succeeded. For more information, see here. You can use the response code to gracefully handle failed HTTP requests. responseCode: The status code that indicates whether your HTTP request has been successfully completed. Make an http get request. Any headers or parameters added before making the request will be included by Domo when making the get request. url: The URL you would like to use to make an HTTP get request. responseString: The response from the endpoint you called. Make an HTTP post request without any request body. Any headers or parameters added before making the request will be included by Domo when making the post request. url: The URL you would like to use to make an HTTP post request. Make an HTTP post request with a request body. Any headers or parameters added before making the request will be included by Domo when making the post request. bodyString: The body of your HTTP post request. Make an HTTP put request with a request body. Any headers or parameters added before making the request will be included by Domo when making the put request.